In many ways, the 1979-80 O-Pee-Chee Hockey set represents a changing of the guard in the NHL. While it contains the 396 cards its predecessors had, it departed from the standard white-bordered design that appeared on recent sets. While the set is best-known for having the Wayne Gretzky rookie card, it is also the set that marked the final appearance of many of hockey's legends. Some of these players were active all the way back to the 1950s. Also, four new teams were added to the league after the collapse of the rival World Hockey Association. The player's photos on the fronts are either posed or game-action shots. A team logo appears in the bottom right, which is surrounded by a solid-colored banner that runs up the right side and opens up above the photo to include the team name. The player's name and position appear above the team name. The card is surrounded by a blue border. The backs feature a design that looks like a skate. In the upper right but outside of the skate is a cartoon about the player. The card number is in the upper left, and the player's vital stats appear in the top area of the skate. A shortened year/life statistic line appears in the middle, followed by a short sentence in English and French. The player's name, team and position appear in the skate's blade area at the bottom. All-Star players have a banner added along the bottom of their base cards to signify the honor. The first eight cards in 1979-80 O-Pee-Chee Hockey feature the NHL's leaders in various categories from the previous season. Card 83 recaps the most recent Stanley Cup finals, and record breakers are honored on cards 161 through 165. Team cards run from cards 244 through 261, including one that shows the Nordiques, one of four teams that were absorbed from the WHL. The other three teams (the Oilers, Jets and Whalers) are scattered through the set. 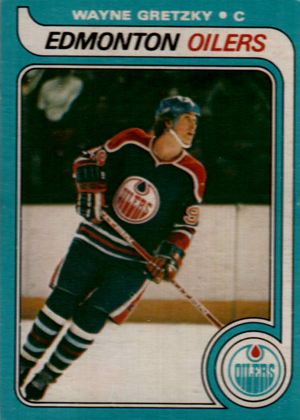 There are also three checklist cards in 1979-80 O-Pee-Chee Hockey. Several retiring stars are featured for the last time in 1979-80 O-Pee-Chee Hockey. These include Gordie Howe, Bobby Hull, Stan Mikita and Ken Dryden. The key card in the set is the rookie card of Wayne Gretzky, which accounts for a large chunk of the entire set's value. It has also been widely reprinted, so collectors should be careful of counterfeits. For higher condition Wayne Gretzky rookies, professionally graded cards may be the safest option. Other notable rookie cards feature Barry Melrose, Bobby Smith, Charlie Simmer and John Tonelli. 1979-80 O-PEE-CHEE OPC #18 WAYNE GRETZKY RC RP REPRINT! GMA GRADED 10 GEM-MINT! 1979-80 O-Pee-Chee uncut sheet with Mint Wayne Gretzky Rookie Card - RARE!